The experience you get at a Michelin-starred restaurant isn’t anything like lunch at your favorite food truck. But that doesn’t mean one’s more satisfying than the other. It’s all about expectations. Set too high, they can leave you feeling disappointed and unlikely to ever return. Product design works the same way. I’m a designer at Help.com, where we make live chat software that enables companies to provide better customer service. Knowing we were entering a highly competitive market, we did everything we could to design and build software that solves users’ needs and stands out from competitors. A big source of our inspiration? Restaurants around the world that completely nail it when it comes to overall experience. So here’s what we learned from them and how we implemented those lessons into our product design. Eleven Madison Park greets every guest by name. This requires some social media stalking and Google searching for the hosts, but it’s well worth it—diners instantly feel welcome, cared for, and, perhaps most importantly, special. We want people to feel at home the first time they visit Help.com. It’s hard to feel welcome if you can’t even find the front door, or if you have to go out of your way to get the attention of the host. Or, worse, if you walk in and you have no idea where you are. Your product’s website should effortlessly explain what your product does. Someone viewing your website should know within seconds what you’re offering , how it can help them, and what to do next. Why would someone need our product? What does our product give someone that they’re currently missing? How will someone use our product? We agreed our website should be visually welcoming, easy to navigate, and make what we do clear so that potential customers would want to stick around and learn more. 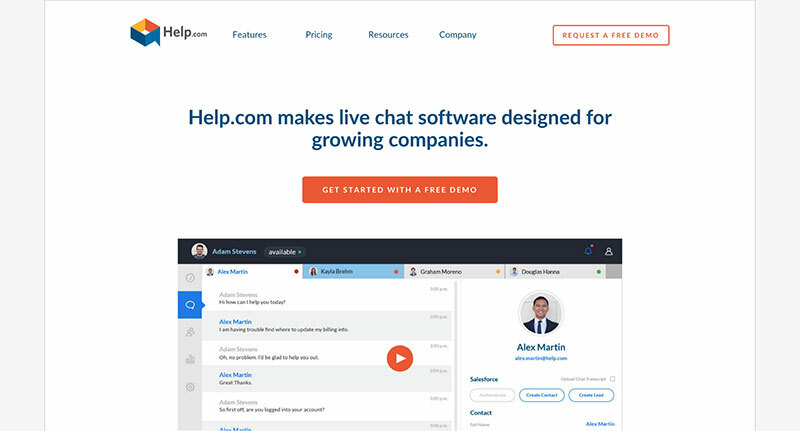 When you visit our site, your eyes are drawn to the large blue statement: “Help.com makes live chat software designed for growing companies.” Within seconds, people know what we do. Good design can’t just stop at a landing page. Like being shown the way to your table, we’ve designed the page in such a way to guide people to the next step. A person who reads that blue explanation may want to just dive right into a demo, and they can do that without thinking by just clicking on the orange button. If someone’s feeling skeptical, they can find main pieces of information by clicking on the navigation at the top. For people who like videos, there’s even one of those to watch. A solid white background keeps things simple. Though your team might be so excited about the product that they adopt a go big or go home mantra, making things overly complicated distracts from your product —and that’s not the goal. Make it a snap for people to get to sign-up forms, videos, feature lists, and pricing info. On Tuesdays, Chef Ben Shewry of New Zealand’s Attica Restaurant offers a discounted menu. The catch? Nothing on it is perfect—it’s all experimental dishes. This gives him a chance to get creative and hone his skills, and he’s not shooting himself in the foot if things fall flat. In fact, this experimentation—even if it’s a failure—makes way for excellent new dishes thanks to feedback from real, live eaters. Product design needs experimentation , too. You could design something that winds up being used in a completely different way than you intended. There’s no way to find out what’s working and what’s falling flat without talking to the people who will use your product. Our CEO Douglas Hanna and our sales team visited hundreds of companies and customer service experts to gather as much information as possible before we started designing. They found out how people use current software and what their frustrations and delights were so we could focus on what was most important. Creating a road map from there and continuing to go back and forth with the feedback given was critical when we created Help.com Live Chat. After that, through conventions and beta client feedback, things continued to evolve and improve. Restaurants require the same basic things to function, but it’s the small details that make the experience one you’re going to tell your friends about. Alinea in Chicago, for example, sets itself apart because of the details they’ve ditched. There’s no music playing, no tablecloths—when the food’s this good, you don’t need to be distracted. With product design, it’s easy to miss opportunities to add in delightful details. Here’s how to find them: anytime you see something and say, “Don’t worry, nobody will notice that”—that’s your opportunity to add in some delight. Adding in these details not only adds something unexpected, it helps establish your brand’s personality. 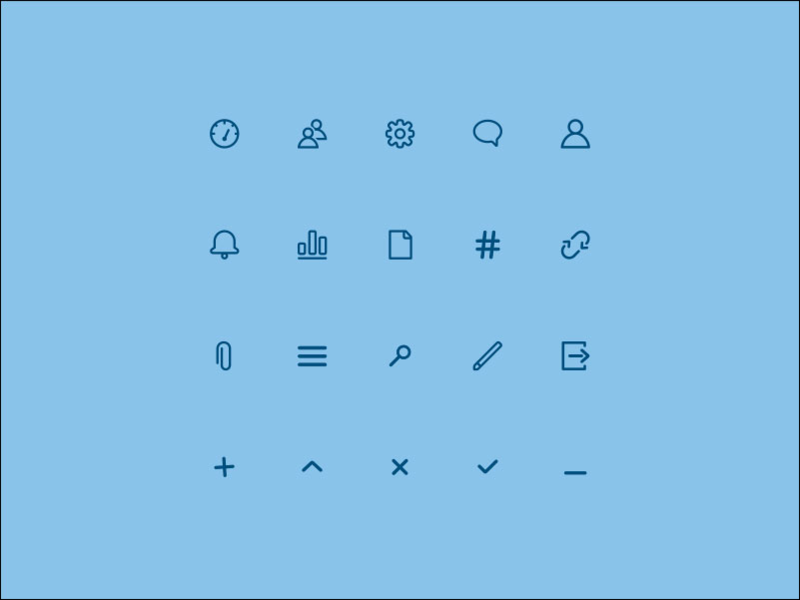 We created our own custom icon set for our product to set ourselves apart from competing products, which all pretty much have the same set of icons. Another thing about adding in small details? If people notice you’ve gone above and beyond for the small stuff, they might think it’s safe to assume you’ve gone all out for the whole shebang. And that’s a great way to make your users feel special and taken care of. Maybe the biggest thing that great product design and great restaurants have in common is their dedication to the people they serve. 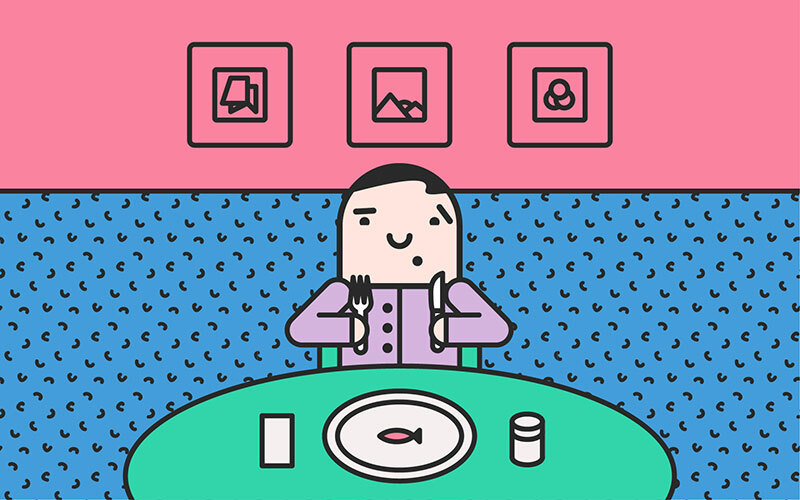 Just like menus, products are never finished—you have to continue to innovate, test, and improve.